Published in 1985, Carl Sagan's book, The Demon Haunted World: Science as a Candle in the Dark, was a Skeptical manifesto and is a must-have for any self-respecting Skeptical library. Sagan used his platform as a public figure and as a popularizer of science to promote the causes of critical and Skeptical thinking. Carl Sagan provides much inspiration for Skeptical tattoos and not surprisingly, a quick google search will return many results. 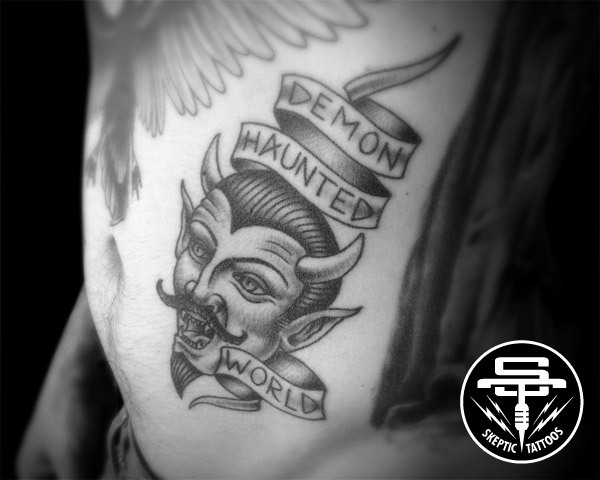 The Demon Haunted World, in particular, is a great source for tattoo material, not just because the book advocates for Skepticism explicitly, but also because of Sagan's poetic prose. Consider the title, The Demon Haunted World: Science as a Candle in the Dark, Sagan leaves plenty of room for visual interpretation and exploration. I went with a "demon" for my tattoo, but I have also seen lanterns and candles used to great effect. In fact, one of my other Sagan inspired tattoos features a candle. Get the book, The Demon Haunted World: Science as a Candle in the Dark.